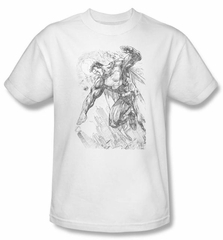 This Superman kids youth T-shirt features pencil sketch of Superman flying over a city. Also available in Toddler sizes: Small (4), Medium (5/6), & Large (7)! "Infant Sizes" "Select Size" "2T" "3T" "4T"